> know how they're written in X-Sampa anyway or what to call 'em. getting close enough to produce a fricative; English "y" is an example. tongue without being close enough to produce a fricative sound. speech organs are in contact, or close contact, in producing a sound. front part of the tongue in contact with the teeth, the "alveolar ridge"
involve contact of the middle part of the tongue with the hard palate. restricting the flow of air in the glottis, where the vocal cords are. practice to be able to produce if they aren't in your native language. producing the vowel sound. "High" or "close" sounds, like "ee" and "oo"
anywhere else on the main charts. /w/ is like English "w". /H/ is like French "u" in "nuit". off the air passage while you swallow. 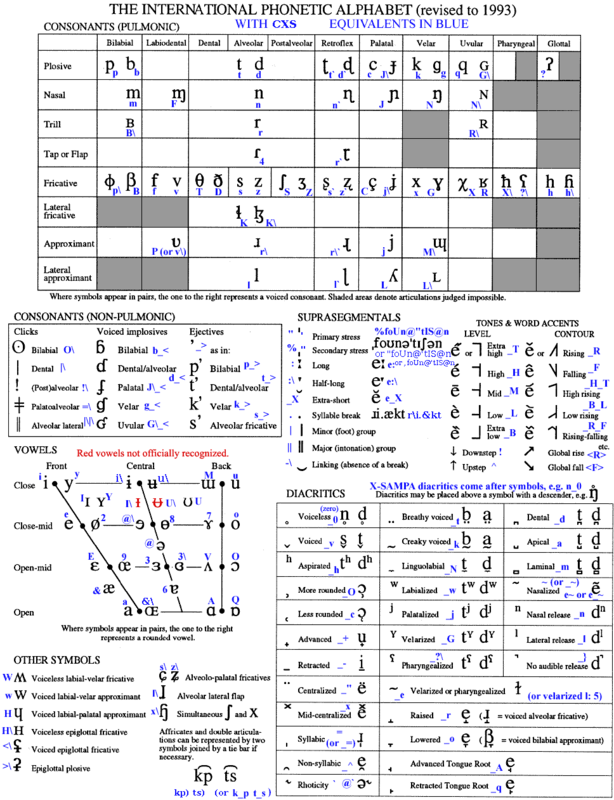 sounds; Polish "si" and "zi" are examples. A lateral flap would be a very rapidly articulated lateral sound. /x\/ is a sound that occurs in some Swedish dialects.